Recently, we shared a meal reconnecting with some long time friends. Now trip to Cleveland to maintain contact with folks we have come to learn have the earmarks of fellow food snobs takes us to a new place we were excited to try. 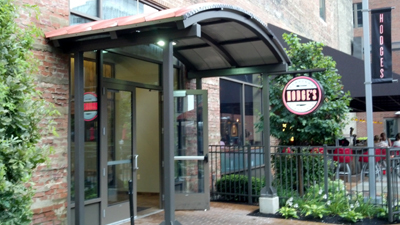 At Bode’s suggestion we are headed to the brick and mortar outpost of Cleveland wheeled kitchen purveyor Chris Hodgson. Having had mixed experiences at the two food trucks (Dim and Den Sum/HodgePodge) we looked forward to seeing how things would translate in a building. Now the folks we’re meeting are professionals, our job titles would qualify us the same. It should be a meal of people who have been able to delay gratification, control baser impulses, at least control themselves. Well, you should be warned up front…what we ended up with was a quartet in the full throes of a culinary Bacchanalian carousing. Hodges on the inside seems to me a version of “Bob’s Country Bunker” from The Blues Brothers flick with a much more modern twist and a much friendlier vibe, even without a chorus of Stand By Your Man. 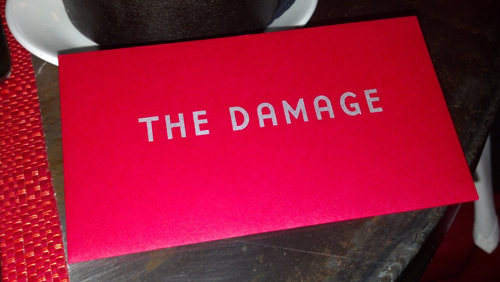 Our server had the quintessential personality for front of the house, fun, able to read the table, ingratiating. Where things faltered was in the actual providing of service, by the staff in general. Empty glasses, difficulty delivering to the entire table together, etc. were consistent issues. Our server could have just plopped down and joined the table and I think it would have been fun…until she started complaining about really, really, really needing a drink of water. As for the food, and I am completely stealing a line from Joel here…just like the service the food was a hodge podge of success and struggle. So what first? Oh, lets finish with the good stuff since we left in a pretty good mood with a good taste in our mouths. But that means the bruises come first. 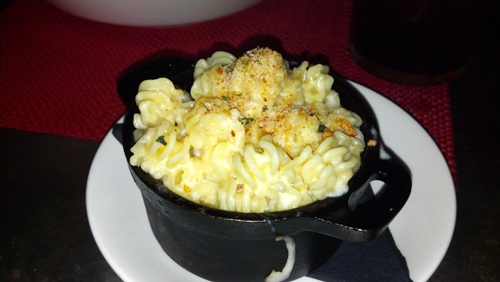 We received complimentary tots, ordered all five of the “snacks” (chicken liver toast, tuna poppers, deviled egg, pickle jar and whipped lard), two appetizers (big dipper and ‘swedish” meatballs), lamb, ravioli, scallops and a pork chop, and finally sides of cauliflower, corn and mac and cheese. Oh, and we followed that up with fruit crisp, brownie, apple pie and fluffer nutter sammitch. Like I said, let the hedonism commence. The snacks were interesting. 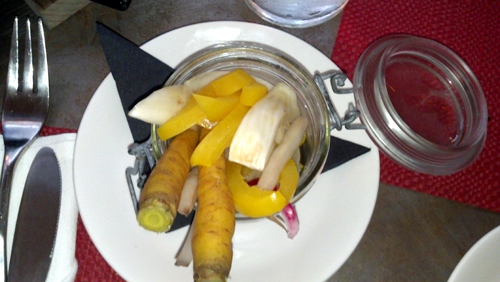 The pickle jar was a mélange of pickled veggies featuring two really tasty carrots and not much else of interest, nice presentation but didn’t deliver much after the carrots. 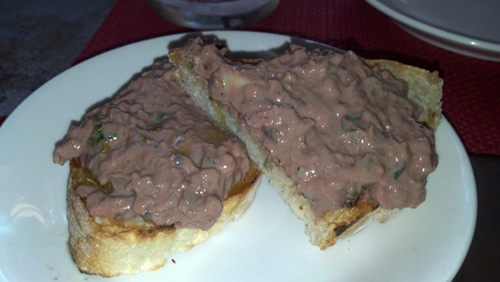 Two toast preparations followed one chicken liver and the other whipped lard…uh huhn…whipped lard. The chicken liver wasn’t bad if you are among the initiated but would never compare to great deli’s or the version we had at Greenhouse Tavern. More intriguing was the whipped lard. Talk about wrong on a plate. 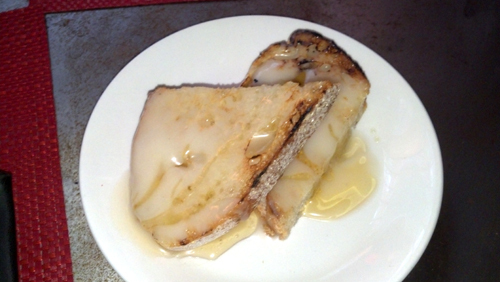 Toast, slathered with rendered pork fat. Less gross but every bit as immoral as you would imagine, the lard was balanced by drizzles of honey which made the bite much more interesting. The menu mentioned cracked black peppers as well. I didn’t see or taste any of it in the dish which might have been helpful in moving it from a curiosity to be checked off the list to something I might order again. The tuna poppers were fine but the tuna could have used a splash of something extra. Dressed with citrusy ponzu the tuna was fresh and clean but couldn’t stand up to the crispy rice nugget that was supporting it. 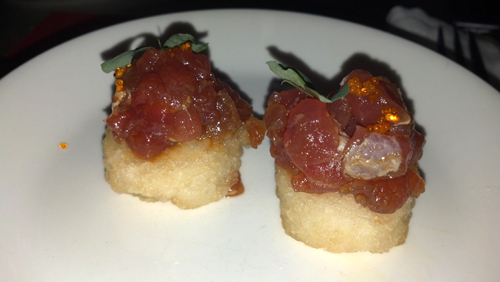 The crunchy platform called out the protein on the plate and scared, the tuna stayed inside. 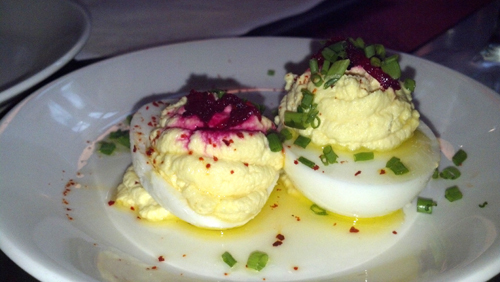 The best snack we ordered was the deviled egg. This thing is not going to replace your grandmother’s but it’s not really trying. 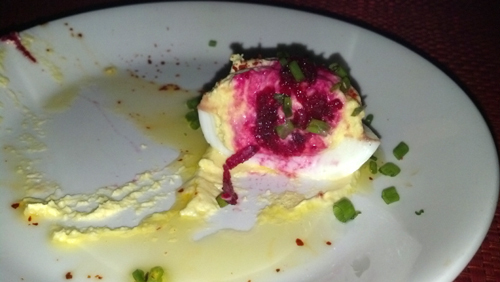 Pickled beets added a unique tang to the yolky mix but the promised bite of horseradish never really materialized, I think a bit more kick may have brought the egg all the way home, instead of dropping it off at the end of the driveway. The snack we didn’t order (was provided gratis) beat the other five hands down for me. 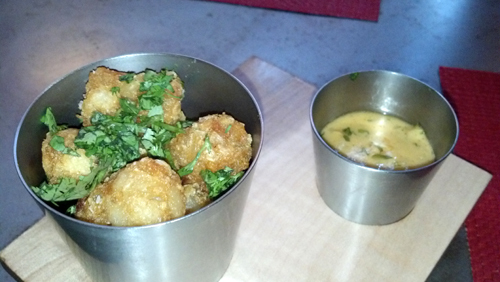 Extra crispy tater tots dressed with cilantro and who knows what else arrived with a cup of southwestern aioli for dipping. Another great outing for tots, if you don’t like tots you might want to seek some professional help. The Bar Knows The Classics! Okay…on to the appetizers. It is with some facetiousness I point out we only ordered two. 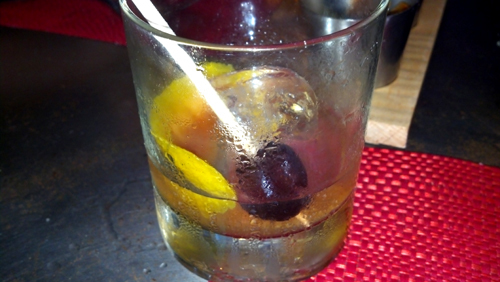 With that in mind I would mention the adult beverage that caught my eye on the menu, the Old Fashioned, Old, Old Fashioned. I don’t really remember the last time I had this Rye, twist, bitters and simple syrup combo but this particular glass was deliciously balanced. Hints of smoke, lightly sweetened, citrus oils and aromatics just muddled together with a stir of the cherry topped swizzle and singular oversized ice cube made a great palate cleanser as well as beverage. 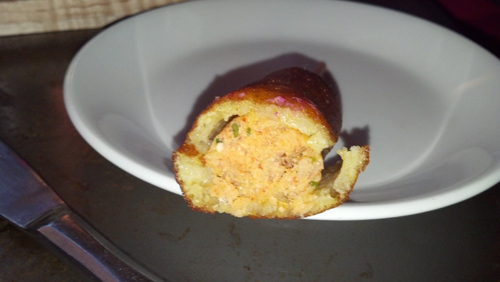 It was in the appetizers that I felt Hodges hit their stride consistently. 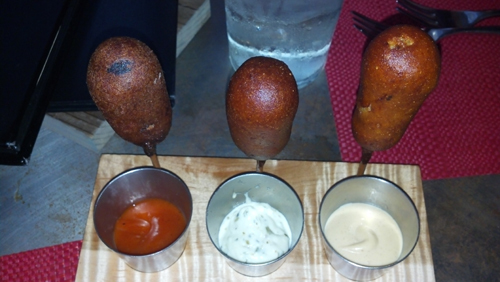 The big dippers were bark brown lobster corn dogs which were tasty in and of themselves. Add to those three sauces all of which were significantly different (chipotle aioli/“tartar” sauce/smoked apple and red pepper jam) but each of which worked expressively well with the lobster on a stick. Hard to believe but better by some were the “swedish” meatballs. 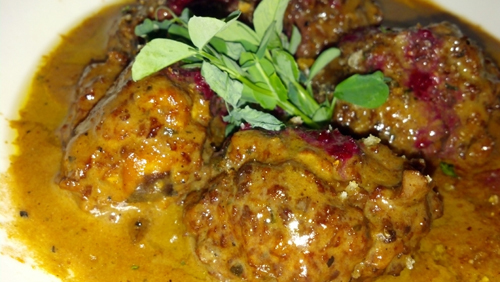 Peppery nuggets of ground meats were on the palate the very definition of meat itself. If someone wanted to know what just the word “meat” tasted like, these would adequately define the term. Topped with blackberry jam and lounging in a sour creamy gravy, ingredients I think you would agree are not particularly meaty, only drove home the roughly ground meat onslaught to the tongue. Stupendous. Three cheers for appetizers. Now the entrees. Tasty But Meager Scallop "Entree"
Here we return to the podginess. 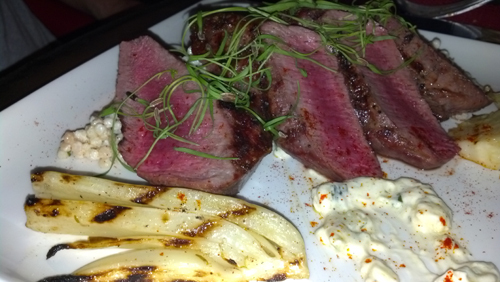 The lamb loin was served with a couscous salad, fennel and a broken yogurt sauce. While the upcoming entrees suffered in the sides department the lamb’s accoutrement were likely the best on the table. The problem was the lamb. Many folks don’t care for lamb due to its gaminess and many methods have been applied to reduce it towards something beefier. Whatever was done here was ultimately way too successful since the lamb while beautifully tender and wonderfully prepared lost the taste of almost anything. This is particularly disappointing when you enjoy lamb expecting that more complex flavor and get something that doesn’t even pack the punch of beef. 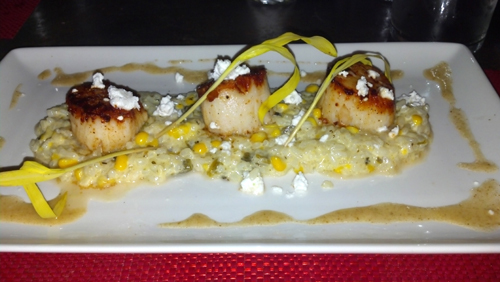 The scallops had a completely different problem. Well prepared, topped with a crust that contained a nice slap of spice that made them interesting, sitting atop a sweet corn risotto and a cumin vinaigrette was well thought out and presented. All four of us could still make them as well at home and to be honest, given the price point the scallops were more highway robbery than dinner. They were nicely sized at least U-20’s if not U-15’s but there were three lonely specimens. Unless there is someone in a wetsuit personally bringing them to the water’s surface either Hodges is getting ripped off or we were. 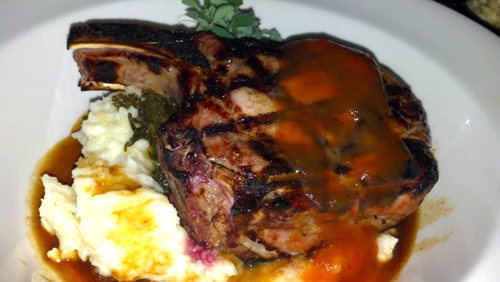 The house brined pork chop was enormous being cut outside of two ribs, tender, delicious, and inspiring jealousy from those who ordered scallops. The potatoes, greens, and demi were confusingly without any merit at all. I dipped my fork several times looking for potato, salt, bitter…anything, only to pass the plate away dissatisfied. 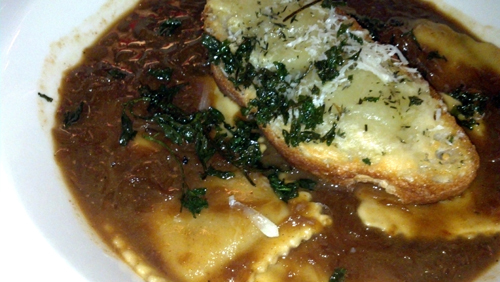 I ordered the ravioli which all put together was the best plate of the four as there was less to detract. First it was kinda fun as instead of the typical meat and red sauce these were French Onion ravs. Pasta pockets stuffed with ricotta and gruyere soaked in a French onion reduction around a raft of a gruyere crouton. The reduced broth was insanely rich and could have been too much but there was a sweetness in the ravioli stuffing that kept it from becoming overpowering. I don’t know if they added something or it was the natural sweetness of the ricotta but along with the fearsome oniony/beefy liquid and the salty crunch of the crouton made a cohesive and enjoyable dish without a standout flaw. is a little extravagant, how about starting with some cheese? 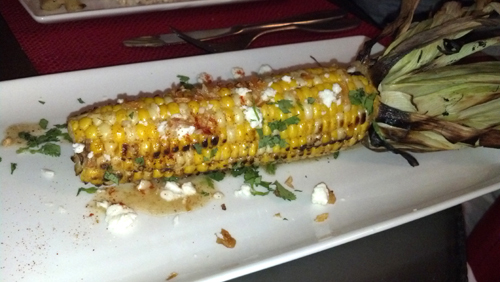 Better was the Ohio street corn which was grilled and topped with paprika, cumin, feta cheese and some type of sauce I couldn’t remember but it was different and tasty. 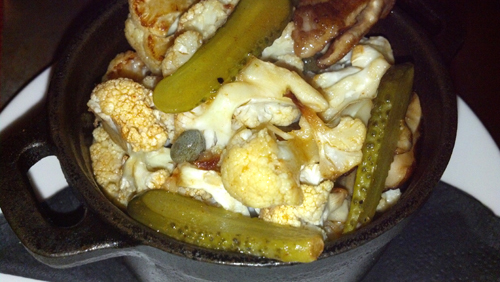 The roasted cauliflower and shiitake mushrooms was even more of a surprise. It contained things that likely would have kept me from ordering it had they been listed on the menu but the gherkin slices and capers and whatever that brown slosh was at the bottom of the cast iron worked well with the veggies. We thought we were done. We should have been. How could be eat anymore. 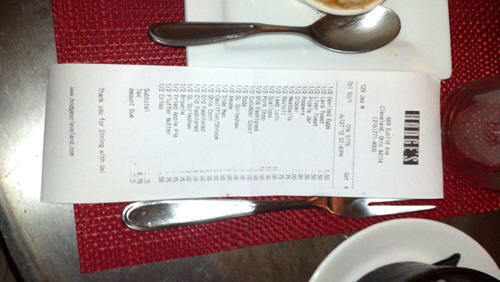 Then we all started laughing when our server dropped off the dessert menu, she was laughing at this point too. We went from none…to share one…maybe two…okay let’s just get four of the five. We could have happily stuck to two but we didn’t know that until they arrived. 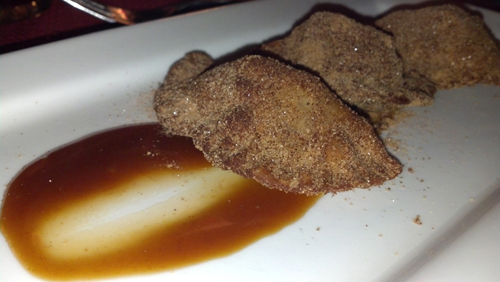 The fried apple pie was atrocious. Ravioli shaped crusts contained uniform dice of apple which had that chemically off taste I associate with apple doughnut fillings that come in a bucket. Cheap and nasty. 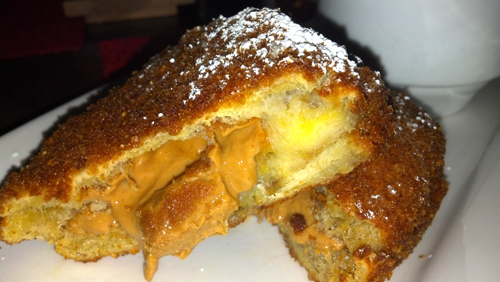 The fluffer nutter sandwich was also fried and accompanied by a pretty good banana ice cream. The sandwich needed something to fight back the torrent of hot peanut butter to make it something memorable, it didn’t. I think my opinion of this sandwich was definitively downgraded by our recent peanut butter experience at The Surly Girl Saloon. 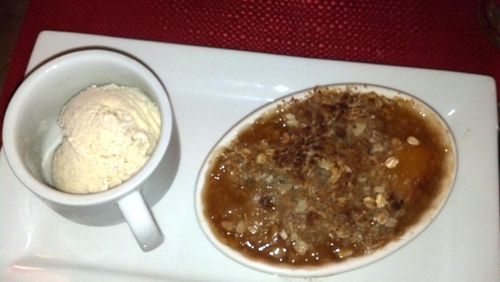 The crisp du jour was a peach rhubarb number that was exactly what you would expect and pretty darn good. 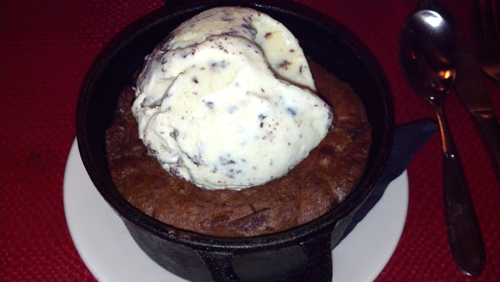 The iron skillet brownie might have started a fight though. Good quality chocolate and some additional ingredients really made this a favorite of my dining companions. If you go to Hodges or either of the trucks I am wholly confident you will receive something really, really, really, good and memorable. I am also pretty confident there will be something that won’t live up to the billing. If it’s me those are pretty good odds, better than many actually and we’ll likely be back. Are You Sure You Want To Go Out With Us...That's Ridiculous. But Fun.